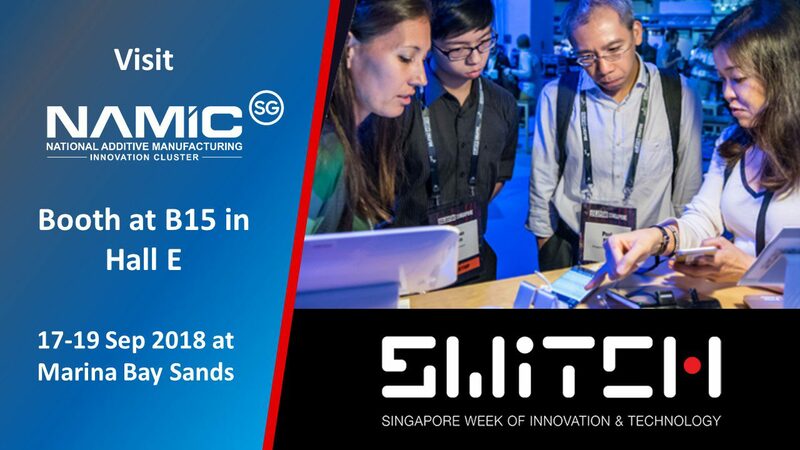 We invite you to our booth at B15 in Hall E at the Singapore Week of Innovation & Technology 2018 (SWITCH 2018). The event is happening from 17 to 19 September 2018 at Marina Bay Sands Expo and Convention Centre. NAMIC is participating with its IHL Hubs from NTU, NUS and SUTD and a start-up, HITCH 3D PRINT. SWITCH 2018 is a platform concept that brings together partners from around the world in the technology, innovation and enterprise ecosystem in a series of complementary tech events. SWITCH 2018 will feature exhibitions, conferences, workshops and activities revolving around topics such as open innovation, technology transfer, tech entrepreneurship, venture funding, and talent development. It also aims to open up a new genre of events that showcases the intersections of technology and lifestyle – the way we live, learn, work and play.